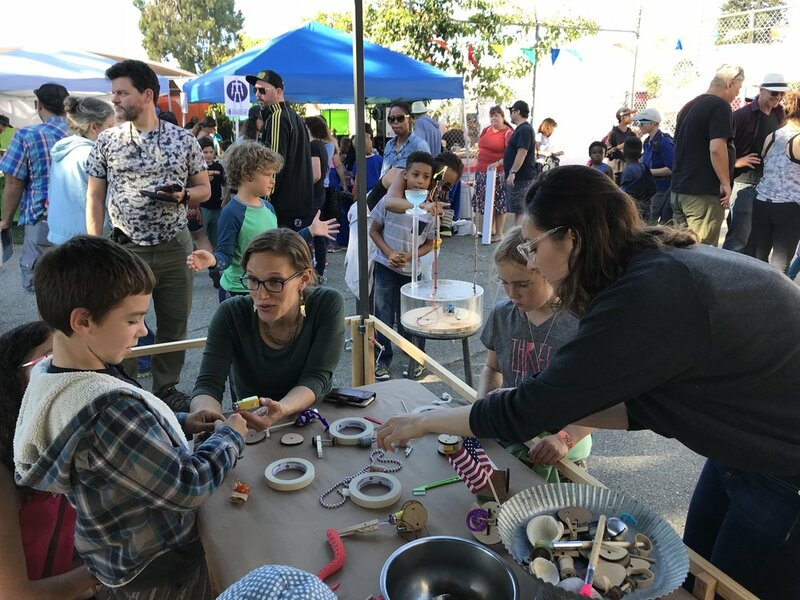 Wonderful Idea Co at EBMMF17 — Wonderful Idea Co.
Last weekend we set up a booth at the East Bay Mini Maker Faire in Oakland. 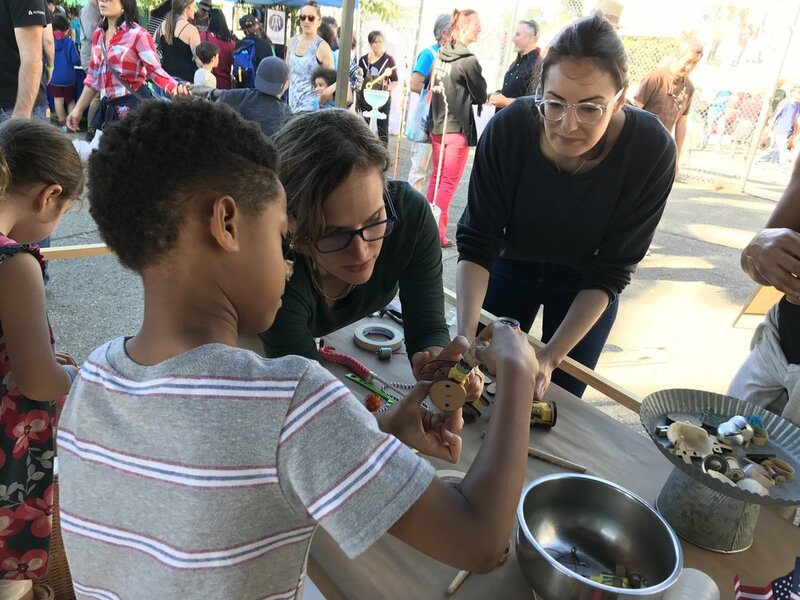 This iteration of Maker Faire is consistently one of our favorites because of the beautiful campus of Park Day School, a diverse audience and a wide range of types of making. Creating a pop-up tinkering space for the event gave us the chance to try out environmentalf elements and test a motions and mechanisms set that we have been prototyping for the past couple of weeks. I wanted to share a few new ideas generated by the experience. For the booth we set up an activity with the prompt of creating useful and useless robots. After a collaborative working session a couple of weeks ago, we simplified the materials set to focus on exploring interesting movements. We modified the DAGU gearbox motors a bit by adding ring terminals to the wires and soldering on a resettable fuse to prevent short circuits. To go a step further, we mounted some of the motors on different shaped pieces of wood and added slide switches. And we lasercut a wide variety of shapes to attach to the shafts and make different movements. When learners sat down at the workshop table we encouraged them to explore the different types of motion first before adding extra materials which included bells, pipe cleaners, flags and rubber tentacles from the Amazeum gift store. This activity felt like a tinkering experience with a low threshold to participation and a wide variety of possibilities. We were impressed by the playful and complex creations that participants constructed. As well it was really fun to see parents and kids work collaboratively to investigate the possible range of motions and imagine new creations. We're looking forward to continuing to refine this set of building blocks, prototype them with colleagues and testing them with learners. To add to the environment we brought a couple of other “robotic” inspirations. One of our favorites is an arduino powered bubble machine that uses two servos and a hobby motor to delight both young and old with it's playful mechanism. And finally, for this event, Nicole created an amazing wall of interactive robot faces made out of found objects. Each one of these faces contained a collection of interesting hardware pieces, electronic components and interactive switches. A few of our favorites were a face with three potentiometers to control a RGB LED in the mouth, a waffle pan with a tongue sticking out and springy eyebrows that moved up and down. It was really fun to see kids and adults test out each one of the faces to see what they would do. Having an installation in the booth was a great way to provoke curiosity and helped to put learners in a state of mind to play and tinker together. We're excited to continue to think about how to design pop-up tinkering workshop spaces for maker faire and beyond and will keep everyone posted as we develop the mechanisms kit.